Last week, while walking through the visitor center at the Lyndon B. Johnson National Historic Park, my eyes were drawn to a black-and-white photo of Johnson sitting under a grove of oak trees, conducting business with a group of staff members and political dignitaries. The next day, as we stood outside the Texas White House and waited to begin our tour, I glimpsed the site where the photo had been made – those same sturdy Southern live oaks, their branches aged and twisted, overlooking the peaceful waters of the Pedernales River. But, of course, those who once worked and rested and schemed in their shade are long gone. For me, the oak was the defining image of our family’s short vacation trip down the road to Central Texas last week, where we climbed Enchanted Rock, hiked along the Pedernales and took in some of our state and nation’s colorful and tumultuous past. Perhaps if you live in certain parts of the country, the idea of being moved by the grandeur of a tree may seem strange. After all, you are surrounded by them. Please know that some of us are not as fortunate. Along the Red River where I grew up, what passes for trees are precious and few, with the exception of the gnarly mesquite. And in the Panhandle, where I spent six years, they are almost nonexistent. I know embarrassingly little about plant life. I can’t even identify many of our most common varieties. But like beautiful paintings, I know when I like what I see. I love the tall pines in my wife’s native Wisconsin and the Cottonwoods along the Red River dividing Texas and Oklahoma. When I moved to Austin in the 1980s to work at the State Capitol, the prevalence of the oak was one of many sources of newfound fascination. The twists and turns of its heavy branches, which sometimes pull to the ground, give the impression that the oak is in motion, heading to some unknown place. At the same time, its bark and wide girth show stability, character and wisdom. When I lived in Austin, I witnessed an amazing outpouring of grief when someone poisoned the Treaty Oak, last surviving member of a grove of 14 trees that had served as a sacred meeting place for Comanche and Tonkawa tribes. The 500-year-old tree’s branches had a spread of 127 feet before the crime. In 1989, I was among well-wishers who visited the sickly tree and read its fan mail, including many cards from children. Through an all-out-effort, the Treaty Oak survived and continues to preside today, as it has for centuries. One day last week I sat on the porch of a dog trot cabin and listened to a commonly told story of how a white pioneering family, much like my own ancestors, survived bands of marauding Indians to establish a future. 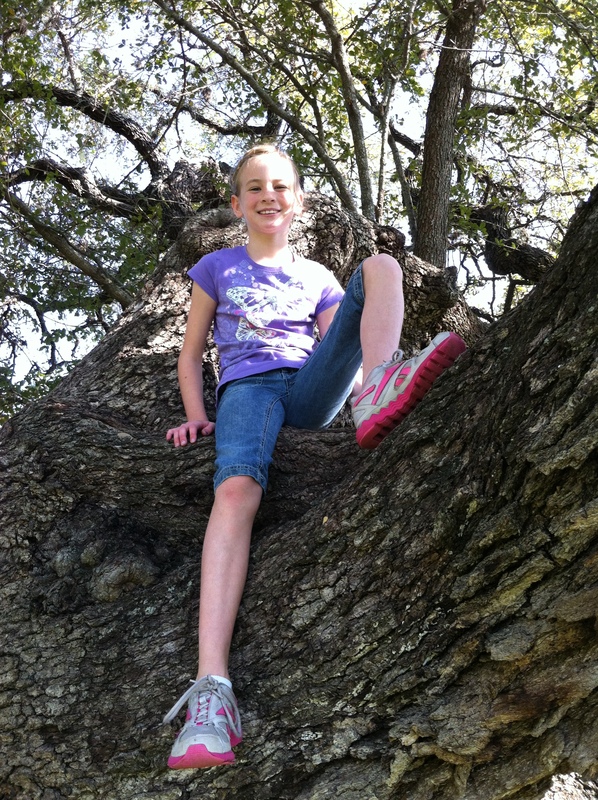 Nearby, my daughter climbed on an enormous oak that was probably in place even then. It occurred to me that, at one time, I would have accepted such stories without question. I know now that our one-sided history lacks the perspective of the people who were here first, swept from their native lands and slaughtered. The oak, however, stands as an unbiased witness, uninfluenced by how history is written. Abram, who was called by God to enter a new land, demonstrated how faithful people are called to honor strangers as he sat in the mid-day heat by the entrance to his tent by the oaks of Mamre. Looking up, he saw three men standing near him. He acted urgently to honor these strangers who at once became guests, insisting that they not pass him by before he had the opportunity to show his consideration for them (Genesis 18: 1-6). This theme, hospitality, recurs throughout the Bible. Central Texas settlers built their cabins amid oak trees, and they were buried under them. Native Americans held sacred meetings among them. President Johnson loved to entertain foreign visitors by hosting barbecues, surrounded by their looping branches. He and his beloved Lady Bird were laid to rest with generations of their ancestors in a grove of oaks, further up the Pedernales. I think the oak is one of God’s finest creations because it holds such compelling images of the human and divine. It tells timeless stories that echo both the soaring potential of humanity and its desperate brokenness. Its wind-driven movements are like a bold dance that celebrates freedom and glorifies God. The voice of the Lord causes the oaks to whirl and strips the forest bare (Psalm 29:9). The oak connects us to one another – all of us, the winners and losers, the haves and the have-nots — through history, as generations pass beneath its leafy branches and sturdy trunk. We live and die under the oak. Its enduring presence speaks of human resolve, our need not only to search for wisdom but to find rest for our souls, and of a God who stands ever so close to us yet is always beyond our outstretched hand.